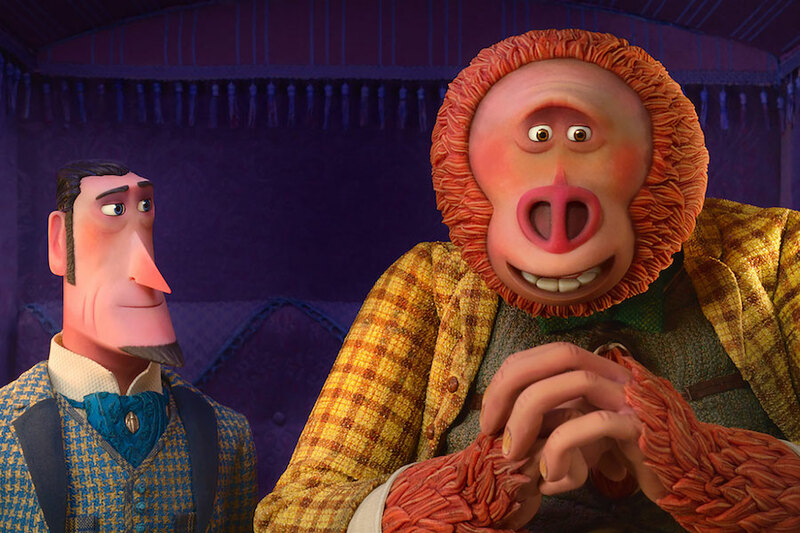 The geniuses at Laika Studios have another winner on their hands with Missing Link, a delightful stop-motion animated feature that’s both fast on its feet and warm in its heart. Other films in Laika’s catalog like excellent Coraline and similarly great Kubo and the Two Strings tend to deal with darker material and heavier themes but their latest effort proves they have a knack for lighter fare too. Despite having a storyline that’s perhaps a bit too familiar, the film has plenty of good-natured laughs and laudable voice performances that make it a family-friendly adventure well worth taking. Hugh Jackman stars as Sir Lionel Frost, a self-aggrandizing but generally well-meaning explorer who desperately wants to join an elite society of adventurers led by Lord Piggot-Dunceby (Stephen Fry). He receives a letter concerning a Sasquatch sighting in the Pacific Northwest and upon traveling there, he indeed happens upon said creature in the forest and dubs him “Mr. Link” (Zach Galifianakis). We learn that not only does Mr. Link know English but that he is the one who penned the letter to Frost, which he wrote to request help in finding the Yetis, his long lost relatives from the Himalayas. At a brisk 87 minutes, Missing Link moves breathlessly from one exotic location to the next but it does so with a grandeur and panache that’s worthy of its intrepid main character. It’s the kind of swashbuckling adventure film that diagrams the globetrotting of its main characters by drawing a red line on an old-fashioned map for us to follow along. The action scenes, like a rambunctious bar fight and a stunning boat-bound foot chase that reminded me of the classic hallway sequence in Inception, move with a fluidity that is made more impressive when you remember that each frame of movement was adjusted by hand. Not only is the film always a visual treat to behold but thanks to a droll script by writer-director Chris Butler, there are plenty of jokes that cleverly juxtapose the haughty and naive natures of its main characters. Turns of phrase and bits of sarcasm from the “refined” English gentleman are lost on the more innocent-minded bigfoot creature, whose literal interpretation of Frost’s words leads to some of the film’s funniest gags. Jackman imbues his character with a brand of pomposity that is somehow endearing but it’s Galifianakis as the earnest and sweet-hearted Mr. Link that gives the most charming performance. I desperately hope this isn’t the last we see of Laika. Despite all five of their films garnering good to great reviews from critics, their output has not resonated with general audiences and Missing Link’s abysmal $5.8 million debut (finishing ninth in its opening weekend) represents a new financial low point for the studio. In an animated landscape that keeps feeling more homogenized, their visionary work and the painstaking lengths they go through to create it feel more important than ever. Here’s hoping that we have more fresh and fun stop-motion adventures like Missing Link to look forward to for years to come. Avengers: Endgame, starring Robert Downey Jr. and Chris Evans, finds the surviving members of the Marvel Cinematic Universe working to reverse the damage caused by Thanos in Infinity War. High Life, starring Robert Pattinson and Juliette Binoche, tracks an astronaut and his daughter as they struggle to survive in deep space while on a mission to discover an alternate energy source. Teen Spirit, starring Elle Fanning and Rebecca Hall, follows a shy teenager who enters an international singing competition and dreams of pop stardom as an escape from her shattered family life. We’ve seen a surge in cinematic Stephen King adaptations over the past couple years and now added to the procession is Pet Sematary, an intermittently eerie but ultimately forgettable retelling of King’s 1983 novel. As someone who has neither read the book nor seen the previous film adaptation from 30 years ago, I went into this new iteration with an open mind but came out oddly unmoved by a tale that’s almost oppressively bleak. While there are some well-earned scares that meet the minimum requirements for modern horror, it feels like the source material was stripped of most of its emotional heft for a more broadly commercial appeal. Jason Clarke stars as Louis Creed, a doctor who relocates from Boston to a rural town in Maine with his wife Rachel (Amy Seimetz), their two young children Ellie and Gage, and the family cat Church. While wandering through the woods one day, Ellie stumbles upon a creepy pet cemetery where their neighbor Jud (John Lithgow) fills her in on some of the town’s mysterious past. After a pair of tragedies subsequently befall the Creed family, Louis and Jud take matters into their own hands and conjure the powerful mystical forces of a sinister burial ground behind the cemetery. Co-directors Dennis Widmyer and Kevin Kölsch lay some out nice foundational work with foreboding musings on death and the afterlife but once the plot kicks in, the pacing begins to resemble a headlong rush towards the conclusion. Although it has some properly macabre touches, the main storyline also has more than a few contrivances and inconsistencies that screenwriter Jeff Buhler isn’t able to fully iron out. More successful is a subplot involving Rachel’s guilt stemming from a conflict with her dead sister, which manifests itself in a pair of chilling setpieces that give the film a terrifying jolt of energy. The effectiveness of these scenes is mainly due to the excellent work from Seimetz, who carries an authentic anxiety in her performance that makes her the most sympathetic character in the story. Although Lithgow brings a sweltering severity to the film’s most ostentatious role, his Jud often feels like more of a ever-present plot device than a fully realized person. On the other end of the quality spectrum is Clarke, who is never fully convincing as Louis in the quieter scenes towards the beginning but strains credulity even further in the ghoulishly over-the-top material that dominates the film’s second half. A quarrel that I have not with the film itself but the marketing of the film is just how many plot details are ruined by the theatrical trailer, which is a trend that is becoming disturbingly common these days. There are at least 3 crucial plot points, including 2 that I would consider major spoilers for those unfamiliar with the source material, that are present in the footage that has played in the months leading up to the film’s release. Perhaps going in fresh would have yielded better results but with its secrets already out in the open, Pet Sematary digs itself into a shallow grave. The Curse of La Llorona, starring Linda Cardellini and Raymond Cruz, continues the supernatural chills of the Conjuring Universe by introducing a motherly ghost who preys on children. Breakthrough, starring Chrissy Metz and Josh Lucas, tells the harrowing true story of a teenager who enters a coma after falling through ice and the family that prays for his full recovery. Penguins, narrated by Ed Helms, is a Disneynature documentary about a penguin who joins millions of fellow males on a quest to build a suitable nest, find a life partner and start a family. Julianne Moore sings and dances her way through another memorable role in Gloria Bell, a English-language remake of the 2013 Chilean film Gloria that successfully recreates the free-spirited gusto of its predecessor. While it may not build to any kind of profound conclusions or reinvent the conventions of the romance genre, the movie tracks the perspective of its middle-aged protagonist with empathy and lightness. In a season that has been particularly dominated by one blockbuster after another, this serves as a pleasant detour that should resonate with people looking for movies based in something that more closely resembles everyday life. We first meet the title character, played by a perfectly-cast Moore, as she confidently makes her way onto the dance floor of a neon-tinged nightclub with a martini in hand. After a meeting in a singles bar one night, she soon begins a fling with Arnold (John Turturro), a fellow divorcee with grown children who is also hoping to start a new chapter in his life. The film follows Gloria and Arnold through the ups and downs of their burgeoning relationship, as well as the often strained interactions that Gloria has with her son Peter (Michael Cera) and her ex-husband Dustin (Brad Garrett). As one may expect from her stellar track record, Moore’s winning performance as the fun-loving and often impulsive Gloria is the strongest thing that the film has going for it. Whether she’s singing along to Olivia Newton-John in the car or dancing her heart out to disco tunes at the club, her joie de vivre is the emotional center point upon which this heartfelt tale finds its pulse. Of course life isn’t always upbeat and neither is Gloria’s story but Moore is more than capable of making the melancholic moments matter just as much as the lighter points in the narrative. For having a character at its center that isn’t afraid to take chances, it’s somewhat disappointing that writer-director Sebastián Lelio seemed to hedge his bets a bit when it comes to the film’s storytelling. Gloria Bell is so slavishly dedicated to each story beat of Lelio’s previous work Gloria that it makes one wonder why he found it necessary to recreate it in the first place if the final products would be so similar. The story of self-discovery works about as well as it did in the original but I wish he had found a way to give new life to this material in the process of translating it for American audiences. The screenplay by Lelio and Alice Johnson Boher has plenty of perceptive and poignant dialogue that clues us into where each character stands without belaboring the point. In an effort to break up an increasingly awkward political conversation between her friends at a dinner party, Gloria chimes in with, “when the world blows up, I hope I go down dancing.” With a buoyant and life-affirming tone that should resonate with people regardless of the stage in life they find themselves in, Gloria Bell rings true with impassioned wisdom and a central performance that captivates from start to finish. Hellboy, starring David Harbour and Milla Jovovich, is a reboot of the comic book series about a demonic superhero who battles supernatural creatures from the underworld. Missing Link, starring Hugh Jackman and Zoe Saldana, is the latest stop-motion animation offering from Laika Studios about an adventurer’s quest to find a Bigfoot-like creature. Little, starring Regina Hall and Issa Rae, is a new body swap comedy in which a demanding tech mogul is transformed into a teenaged version of herself. I’m joined by my friend Jared as we say the magic word on Shazam!, the latest superhero movie in DC’s Extended Universe. Then we discuss other items we’ve been watching, including Netflix’s Love, Death & Robots and the excellent crime thriller The Standoff at Sparrow Creek, which is currently available to rent on demand. Find us on Facebook, Twitter and Letterboxd. Warner Bros brings some levity to their generally dour DC Extended Universe with Shazam!, a well intentioned but ultimately disappointing superhero entry that strains a bit too hard for likeability. Part family-friendly comedy and part body swap movie, it does offer some new storytelling elements to the most saturated film genre at the moment but the execution of these ideas doesn’t feel as inspired as it should. Director David F. Sandberg is working hard to emulate the tone of kid-centric 1980s Spielberg productions like E.T. and Gremlins and in the process, he reminds us how challenging it is to recreate the magic of those classics. After a drawn-out prologue starting in the mid-70s, we’re brought up to present day to meet Billy Batson (Asher Angel), a troubled teen who has gone from one foster home to another after being abandoned by his mother at a young age. 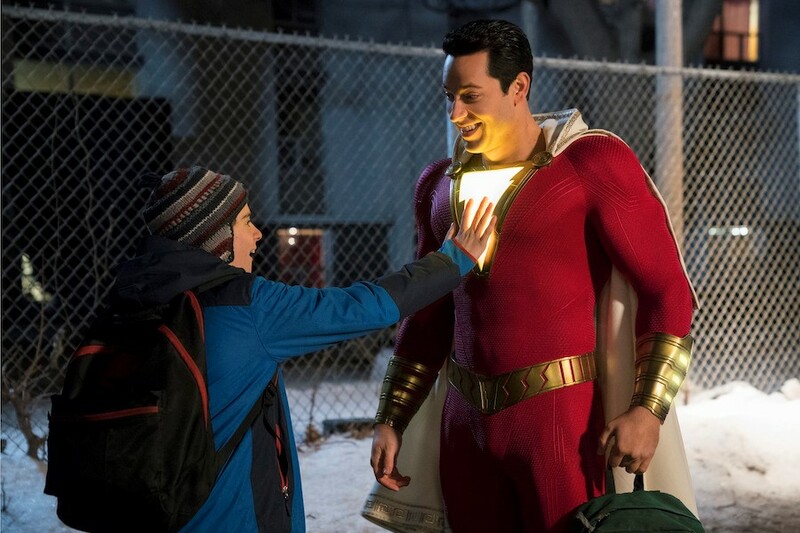 Traveling on the subway on day, Billy is suddenly transported to a magical realm where a weakened wizard named Shazam (Djimon Hounsou) bestows Billy with the ability to transform into an adult superhero (Zachary Levi). Along with his newest foster brother Freddy (Jack Dylan Grazer), Billy learns how to harness his newfound powers in order to stop the villainous Dr. Thaddeus Sivana (Mark Strong). The strongest facet of the film can be found in Levi’s performance as the body-swapped hero, which channels the same wide-eyed giddiness that Tom Hanks utilized for his similar role in Big. He’s certainly the source of the movie’s biggest laughs, especially during a scene in which he strides confidently into a gas station and announces to the teller that he’d “like to purchase some of their finest beer, please.” Levi also has excellent comedic chemistry with Grazer, who gets in a few quality one-liners of his own despite the fact that his character is underdeveloped and sidelined at critical points in the story. In an ironic twist, Strong represents the weakest aspect of the movie as he glowers through another bland and one-note supervillain role that diminishes any of the storyline’s potential. 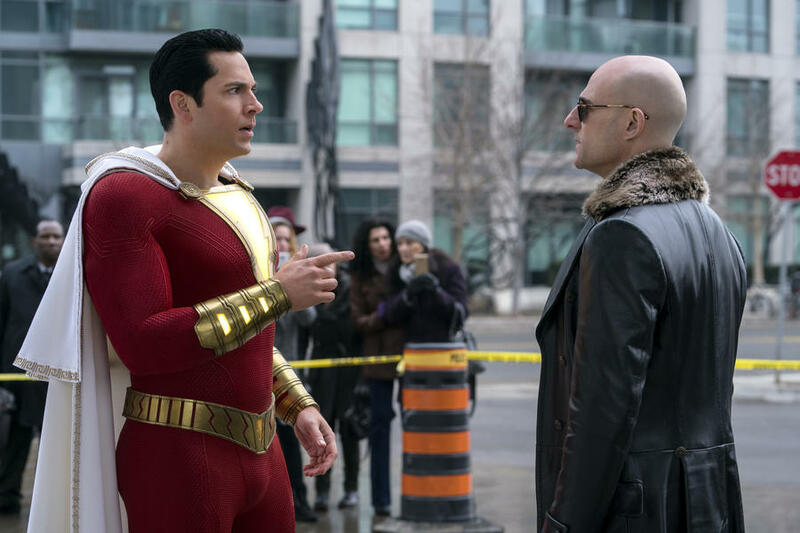 Shazam is the kind of idiosyncratic character that demands a more compelling foil but Sivana offers the same exact kind of obstacles for our hero that we’ve seen plenty of times before. At one point during the film’s pre-production, Dwayne Johnson was lined up to play Shazam’s nemesis Black Adam, which is a much more compelling scenario than what Warner Bros opted for instead with this rote showdown. The screenplay by Henry Gayden does have a handful of quality jokes, despite being all over the map in terms of comedic tone, but it’s saddled with the task of also providing a straight-faced superhero narrative. The film’s overextended climax, which contributes heavily to the already bloated runtime, involves the same kind of weightless CGI aerial brawl that sunk the otherwise worthwhile Superman outing Man of Steel in 2013. I applaud Shazam! for attempting to shake things up within the DCEU but the film lacks the kind of clear artistic conviction that would have made the gamble pay off. 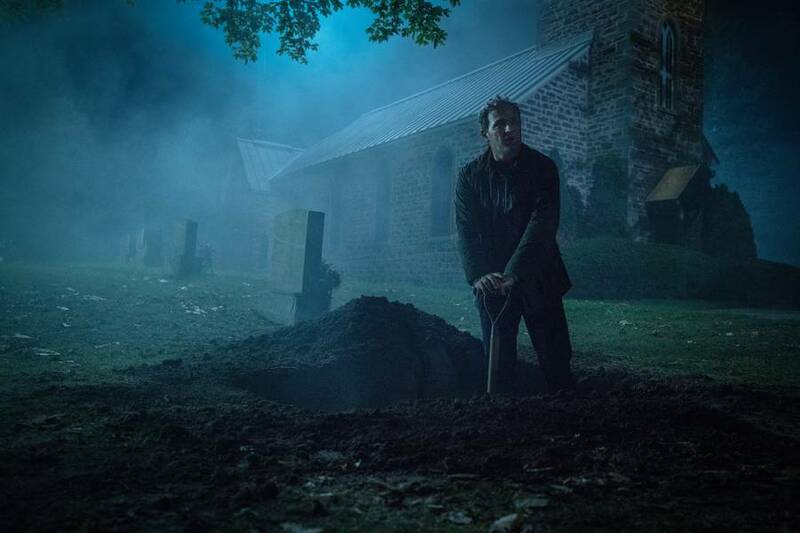 Pet Sematary, starring Jason Clarke and Amy Seimetz, is the latest Stephen King adaptation about a family who summons evil forces after meddling with a mysterious burial ground. The Best of Enemies, starring Taraji P. Henson and Sam Rockwell, tells the true story of a civil rights activist and a Ku Klux Klan leader who debate school segregation in 1970s North Carolina. 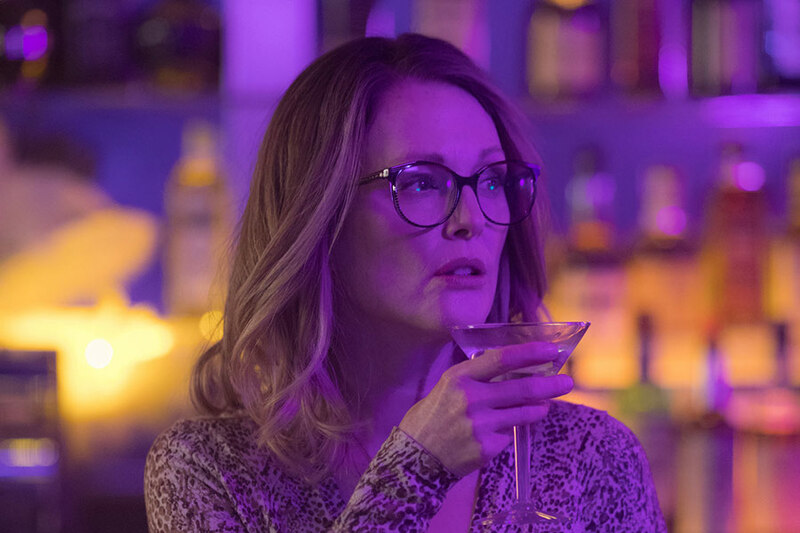 Gloria Bell, starring Julianne Moore and John Turturro, reimagines 2013’s Gloria about a free-spirited woman in her 50s who seeks new love amid the Los Angeles dance club scene. Writer/director Jordan Peele follows up his breakout debut Get Out with Us, another visceral and confident work of horror with plenty of well-executed scares and laughs. While Get Out seemed to exist in a genre that it carefully carved out for itself, Peele’s latest effort is more of a conventional tale of modern horror that isn’t as clear-minded about its social commentary but is directed with such a high level of craft that it almost doesn’t matter. It’s packed with shocks and twists that are meant to keep the audience guessing and even if the answers don’t quite live up to the questions, the ride is well worth taking. 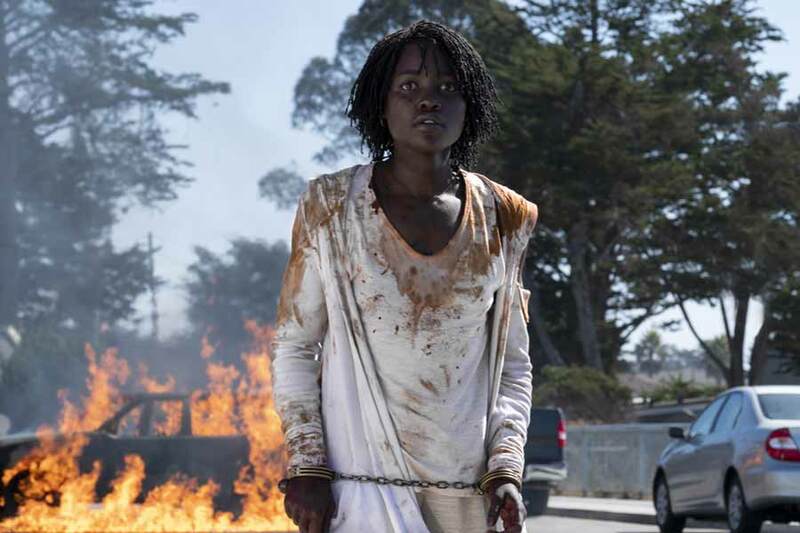 The premise centers around Adelaide (Lupita Nyong’o) and Gabe Wilson (Winston Duke), who are vacationing at their Santa Cruz beach house with their children Zora (Shahadi Wright Joseph) and Jason (Evan Alex). Upon their first day of the trip, they meet with family friends Kitty (Elisabeth Moss) and Josh (Tim Heidecker) on the beach when Jason has a disturbing encounter with a stranger. Things only get more troubling that evening when the Wilsons are visited by a group of 4 costumed figures who seek to break into their home and turn their idyllic vacation into an unshakable nightmare. What’s especially invigorating about Peele’s first two directorial efforts is how well he is able to build up tension slowly in the more terrifying moments but then release that tension brilliantly with perfectly-placed humor. Not only do the moments of levity feel organic to the situation that the characters find themselves in, they also feel characteristic of Peele’s specific sensibilities as a comedy writer. The scene in which Gabe initially threatens the villainous interlopers could have played out in a more conventionally tense way but instead, Duke’s sense of exaggerated bravado leads to some unexpected laughs. Assembling the larger thematic puzzle pieces, from an opening prologue that addresses abandoned nationwide tunnels to a recurring Old Testament verse, is unfortunately not as satisfying as the creepy chills on the film’s surface. Even murkier still is the explanation behind the origin of the antagonists and the mythology behind their motives, all of which produces lingering follow-up questions rather provide adequate closure. Still, Us is another crowd-pleasing winner from a burgeoning director who is continuing to establish a brand of horror that is unquestionably bold and refreshing. 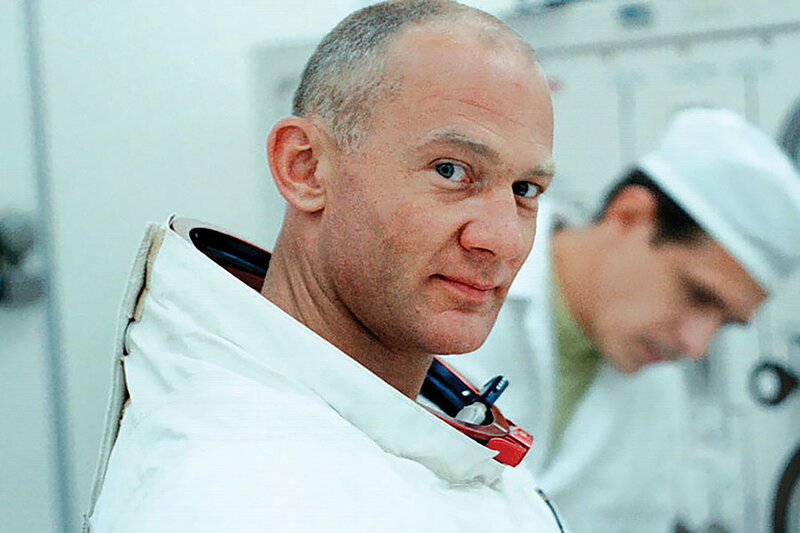 Though there have been plenty of other movies and TV specials about the first moon mission, we haven’t seen anything quite like the wondrous new documentary Apollo 11. Utilizing previously unseen footage from the 8-day period during which the mission took place in July 1969, director Todd Douglas Miller has crafted a meticulous and often thrilling recreation of mankind’s most daring feat. Unlike last year’s excellent First Man, which tells a more personal story centered around lead astronaut Neil Armstrong, this film is much more straight-forward about the specifics of the spaceflight. Miller, who is also credited as the sole editor, eschews typical documentary conventions like having the events explained to us by historian talking heads or a narrative voiceover. Instead, he cuts the footage in a way that even people who don’t know the ins and outs of space travel would be able to understand. When the astronauts are discussing upcoming tactical maneuvers with NASA headquarters, we’re shown diagrams that clearly demonstrate what the crew is about to attempt. What’s most impressive about this aspect in particular is that even though these visual depictions mirror what a teacher might draw on a chalkboard, the film never feels like a boring school lecture. Given that all of the documentary’s footage is taken from 50-year-old film, one may expect that the look of this movie would be quite dated but the images are full of new life with the aid of digital restoration. Thanks to Miller’s direction, the film has a cinematic immediacy to it from the first frame, which begins by highlighting the massive scale of the operation as the camera glides up the 6-million pound rocket ship. There are also gorgeous shots, like one from the aircraft carrier USS Hornet awaiting the trio of astronauts, that feel both incredibly modern and indelibly timeless at the same time. With the aid of Matt Morton’s majestic musical score, unbroken shots of the crew completing the most challenging portions of the mission are made even more awe-inspiring than they would be otherwise. When the frame is divided into several split-screens that feature various teams working within mission control, the pulsing synth-driven soundtrack gives appropriate urgency to their efforts. The rest of the audio is filled out expertly by sound designer Eric Milano, who poured through thousands of hours of uncatalogued audio recordings to capture the most essential pieces of dialogue from this landmark event. When we think of the moon landing, typically Armstrong or Buzz Aldrin come to mind first but this documentary is a reminder of the hundreds of talented individuals whose hard work made this dangerous mission a success. One such example is found in an early tracking shot that depicts the seemingly endless rows of computing equipment and scientists dedicated to achieving the impossible. Thanks to the efforts of Miller and everyone behind the production of Apollo 11, their work can now be seen through a new lens of clarity and preserved for future generations looking for inspiration once again. 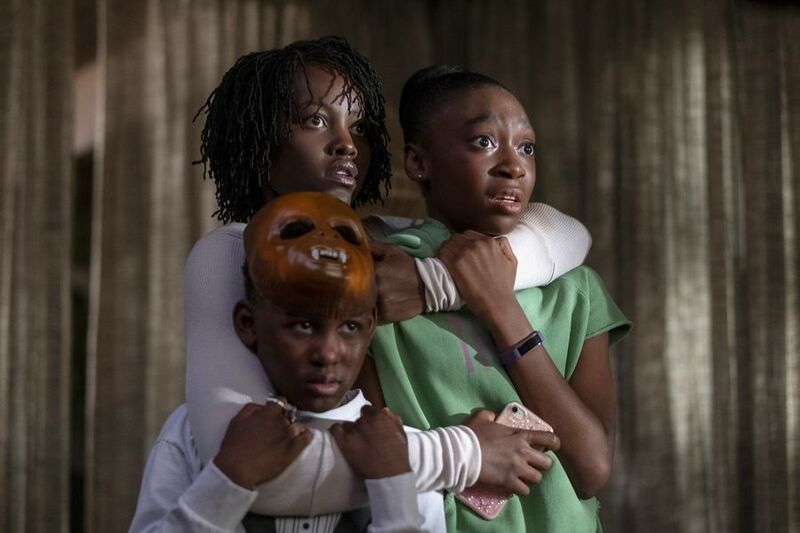 Us, starring Lupita Nyong’o and Winston Duke, is a new horror film from Get Out director Jordan Peele about a family of four whose vacation is upended by a diabolical group of home invaders. Hotel Mumbai, starring Dev Patel and Armie Hammer, tells the harrowing true story of the 2008 Mumbai terrorist attacks from the perspective of the staff at the Taj Mahal Palace Hotel. Back in theaters for its 20th anniversary is Cruel Intentions, the romantic teen drama starring Ryan Phillippe and Reese Witherspoon about a pair of wealthy step-siblings who make a lascivious wager. 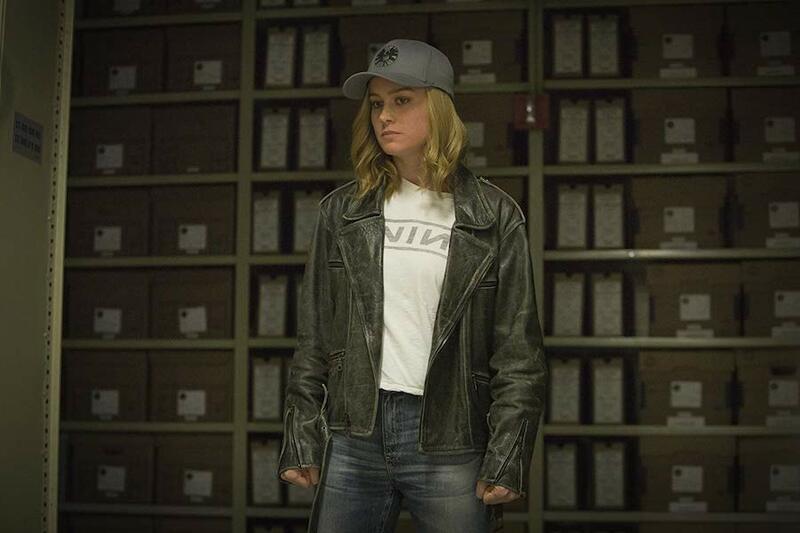 The Marvel Cinematic Universe makes room for yet another superhero in Captain Marvel, an action-packed addition to the gargantuan series which is noteworthy for its female lead but not for much else. It’s a perfectly acceptable product from Marvel Studios, which has produced an average of 2 comic book movies a year for the past 10 years, but it rarely distinguishes itself enough to transcend that dubious designation. For a film that revolves around its superheroine searching for her true identity, it’s painfully ironic that the film itself doesn’t break with the “Marvel formula” long enough to establish an identity of its own. 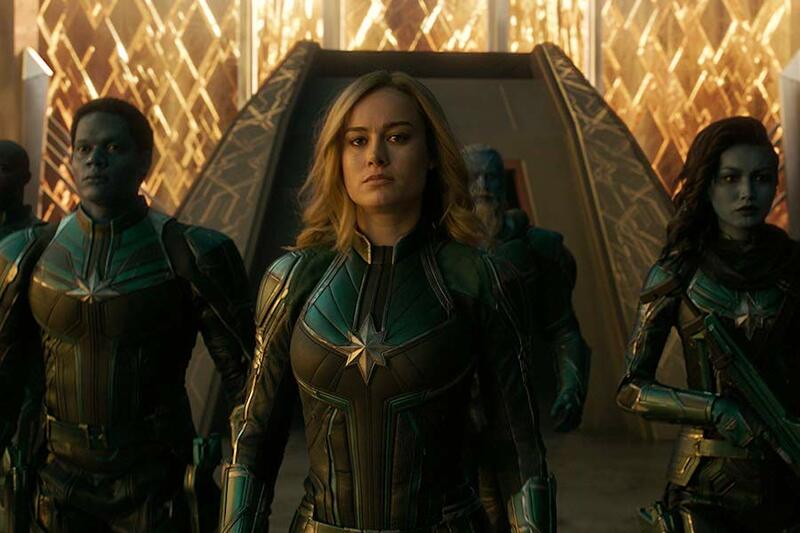 Set in the mid-1990s, the story centers around Vers (Brie Larson), a member of the alien race known as Kree who trains under the mentorship of the revered warrior Yon-Rogg (Jude Law). During a battle against their shapeshifting foes known as Skrulls, Vers escapes to Earth and is discovered by SHIELD agent Nick Fury (Samuel L. Jackson) after she crash lands inside a Los Angeles Blockbuster store. On the run from Skrull soldiers led by the treacherous Talos (Ben Mendelsohn), the two follow clues that point towards a hidden past that Vers had on Earth and advanced technology that may end the intergalactic alien feud once and for all. The best elements of Captain Marvel revolve around the chemistry between Larson and Jackson in a storyline that feels like it’s ripped straight from a ’90s buddy-cop movie like Die Hard with a Vengeance. Thanks to some utterly convincing digital de-aging in post-production, Jackson even looks like they pulled him right off the set from one of those films and placed him in this fish-out-of-water tale. The banter and comedic timing between the determined Vers and the incredulous Fury lead to the biggest delights of the film and offer respite from the tiresome space conflict that drives the majority of the narrative. Directors Anna Boden and Ryan Fleck, known for crafting intimate character studies like Half Nelson and Sugar, would seem to be a great fit to tell an origin story with an amnesiac at its center. Sadly, the investigation of Vers and her backstory is relatively shallow and lacks the type of nuance that we’ve come to expect based on the directors’ previous work. Their lack of experience in the action genre is apparent from the numerous setpieces that are somewhat enjoyable but lack the visual flair of other entries in the Marvel canon. There’s also no doubt that some of the more rambunctious musical cues are incongruous with the rest of the film’s general tone. The cast certainly does the best that they can with the material and most of the actors and actresses are given at least one scene in which they really shine. Despite portraying a woefully underwritten central character, Larson is able to balance snark and stoicism to mostly make up for the script’s deficiencies. Newcomer Lashana Lynch is terrific in her limited role and her scenes with Larson are hands-down the most human moments in the entire film. There just aren’t enough of them to give Captain Marvel the kind of emotional heft that it needed to stand out from the increasingly homogeneous superhero landscape. Wonder Park, starring Kenan Thompson and Ken Jeong, is the latest offering from Nickelodeon Movies about an imaginative young girl who creates an amusement park filled with talking animals and fantastical rides. Captive State, starring John Goodman and Ashton Sanders, depicts a world in which an uncompromising extraterrestrial force has fractured humanity into two opposing sides. Five Feet Apart, starring Haley Lu Richardson and Cole Sprouse, adapts the young adult novel about pair of teenagers with life-threatening illnesses who fall in love after meeting in the hospital. I’m joined by my friend James as we go higher, further, faster to discuss Captain Marvel, the latest Marvel movie starring Brie Larson. Then we talk over some recent TV options, including the Netflix reality series Losers and the HBO series True Detective, which just concluded its third season. Find us on Facebook, Twitter and Letterboxd.